Stephen L. Isaacs is president of Health Policy Associates in San Francisco, California. James R. Knickman was vice president for research and evaluation at The Robert Wood Johnson Foundation in Princeton, New Jersey at the time this book was written. He is currently the president and chief executive officer of the New York State Health Foundation. Foreword: Of Hedgehogs and Flywheels (Risa Lavizzo-Mourey). Editors’ Introduction (Stephen L. Isaacs and James R. Knickman). Section One: A Ten-Year Retrospective. 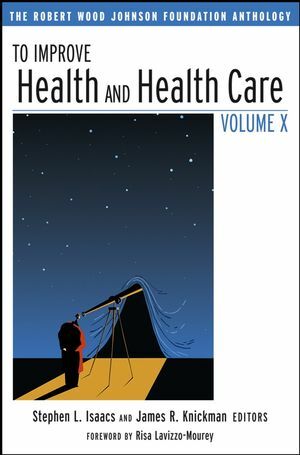 1 Health, Health Care, and the Robert Wood Johnson Foundation: A Ten-Year Retrospective, 1996–2006 (Stephen L. Isaacs, James R. Knickman, and David J. Morse). Section Two: Quality of Care. 2 The Dartmouth Atlas of Health Care (Carolyn Newbergh). 3 Improving Chronic Illness Care (Irene M. Wielawski). 4 Increasing Health Insurance Coverage at the Local Level: The Communities In Charge Program (Mary Nakashian). 5 The Partnership for Long-Term Care: A Public-Private Partnership to Finance Long-Term Care (Joseph Alper). Section Four: Services for Vulnerable Populations. 6 Supportive Housing (Lee Green). 7 SPARC—Sickness Prevention Achieved Through Regional Collaboration (Paul Brodeur). 8 The Southern Rural Access Program (Digby Diehl). Section Five: The Robert Wood Johnson Foundation. 9 The Robert Wood Johnson Foundation: 1974–2002 (Joel R. Gardner). 10 Engaging Coalitions to Improve Health and Health Care (Laura C. Leviton and Elaine F. Cassidy). Tables of Contents of Previous Volumes.